What is New Level Sports Ministries? 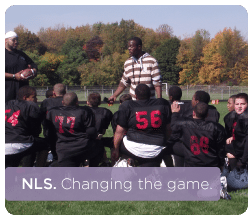 New Level Sports Ministries is a Non-profit Student Athlete Support Service, for ages 8 – 18. Our mission is to maximize and balance the intellectual, spiritual, mental and physical elements of all participating student-athletes. We are committed to assisting our student-athletes to develop purpose driven lives through participation in educational enrichment, personal growth and physical development activities. Our Philosophy and organizational strategy grew out of our growing concerns that many student-athletes, while successful in athletic programs, were not adequately prepared to pursue educational and personal development opportunities beyond the field of competition. New Level Sports Ministries’ multi-level approach incorporates Parents, Educators, Community Members, Institutions of Higher Learning, Athletic Programs and most importantly the student-athletes into the process to ensure the tools required to attain the highest level of success are readily available for the participating athletes. The staff of New Level Sports Ministries is committed to ensuring the participating student-athletes have the opportunity to excel to limitless heights. One of the guiding principles of NLSM is to support and develop the “complete student-athlete” to ensure success on and off the field. This means having programs that go beyond the sports arena and into other aspects of life. A complete student-athlete is a person who is capable of excelling in the classroom, spiritually grounded and has a healthy outlook on life, understands the business of sports and careers that can be made within the sports world, and is in peak physical condition with the fundamental skills to be successful in the sports of his or her choice. To address the broad needs of the complete student-athlete, NLSM provides four program areas. Academic Enrichment Program: Tutoring and homework assistance activities that prepare student-athletes to meet or exceed classroom expectations and equip them to successfully graduate from high school and gain entry into the college or university of their choice. Personal Growth Program: Life-skills activities that support the social and spiritual development of student-athletes to build good character and inspire positive choices. Sports Business & Entrepreneurship Program: Provides opportunities to create and develop businesses through the NLSM Business School. Student-athletes learn how to develop professional and entrepreneurial opportunities in businesses related to the sports industry. Physical Development & Fitness Training: Basic skill training and physical training for student-athletes through the sports and fitness activities they participate in. All of the instructional programs are developed with the intent of exposing our student-athletes to every aspect of the game and to create an interest that will encourage the athletes to pursue the sport to the highest level. NLSM is committed to ensuring the participating student athletes have the opportunity to excel to limitless heights.